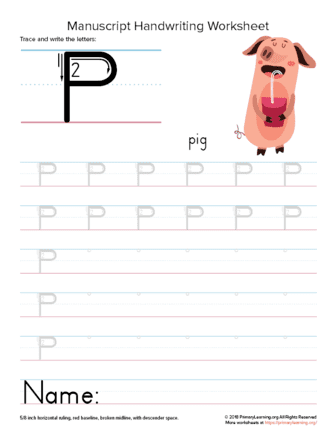 Pig will help your child practice writing and tracing Letter P! First, kids practice tracing the Uppercase Letter P and learn how to form it. Then, they practice writing the Uppercase Letter P several times. There is a start point for each letter, which helps students place the letter on the lines correctly. Kids also trace a few words that start with this letter. Do you know more animals starting this letter? Ask your child for a little challenge! Each page focuses on one letter and has a letter formation directions on the top. This handwriting worksheet has 5/8 inch horizontal ruling and is suitable for first-grade students. This worksheet is designed in Zaner-Bloser Style.